Located on Freeman’s Way less than ¼ mile from The Captains Golf Course is the golf Practice & Learning Center. The Center features 40 grass tee stations on rolling terrain which gives you a truly realistic golf course experience. Don’t get that sinking feeling when your golf ball lands in a sand trap! Located behind the indoor teaching building is the Learning Center’s bunker where you can fine-tune your sand game. Round out your short game session with chipping and putting at our two practice greens located at The Captains Golf Course. Golf carts are not allowed to be driven to the Practice Range, you must drive your car there. From the golf course parking lot, take a right out of the driveway. Go about 100 yards and take your first left into Commerce Park. The Practice Range is the third property on the right. Tokens are available from a dispenser at the range (must have correct change) or in the Pro Shop. See our Rates page for bulk rate deals for the Practice Range. Women’s Golf clinics golf clinics are available on Thursday mornings, May through September. Three-Day Junior Golf Schools are held Monday through Wednesday mornings each week during the months of July & August. For more information please call the Pro Shop at (508) 896-1716, ext. 102 or e-mail us. *Pre-registration is recommended for all clinics. Whether you’re a beginner or an experienced golfer, our PGA certified teaching professionals golf instructions can help you. Lessons range from 45–60 minute individual sessions to 2-4 person group sessions. 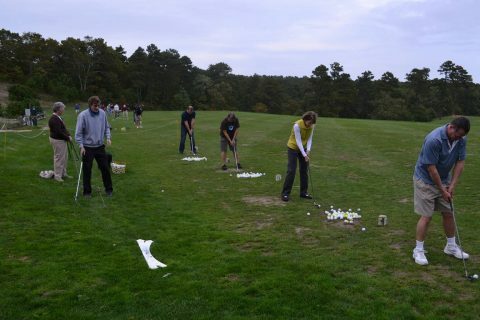 You can also schedule a 3- or 6-hole playing lesson that focuses on course management. Get together with up to 4 friends and book a clinic on the topic of your choice. Our golf professionals specialize in teaching junior golfers. 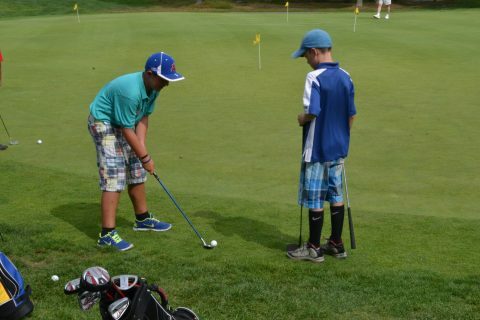 In addition to our junior clinics, we offer private & group lessons. The always popular Captains 3-day Junior Golf School is held weekly in July and August. Every Tuesday night for children from ages 6 – 18. Pre-registration is required for this event. This league is designed to give junior golfers an opportunity to experience playing golf in a fun and mildly competitive environment. The league begins on Tuesday July 2nd and runs until Tuesday August 20th. Please call or e-mail the professional staff for further information. For more information on our teaching programs, please call 508∙896∙1716 ext.102; you can also e-mail us.